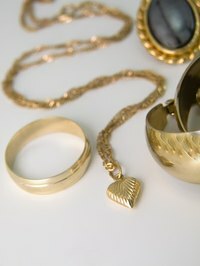 Gold plating is the process of adhering gold to another metal. Kits that are often used by experienced jewelers are also available for home use. Current technologies have eliminated the use of cyanide in some kits, which is ideal for both the environment and the home user. The object to be plated is placed in an acid solution and charged with low voltage electricity, which carries and adheres the atoms to the item being plated. The plating process does not take very long, and several pieces can be plated in a single day. Use the polishing cloth and thoroughly wipe clean the article to be plated. Then place the piece in the ultrasonic cleaner. The ultrasonic cleaner is filled with a mixture of water, liquid soap and ammonia. Refer to the manufacturers directions for the correct ratios. Let the piece stay in the cleaner for at least 30 minutes, then rinse it under running water. Take the rectifier, or battery, from the electroplating kit and set it to 10 volts. Set the temperature of the solution to 190 degrees Fahrenheit. Attach the black wire (negative) to the plating rack. Place the rack into the electrocleaner solution for 30 seconds. Remove the rack from the cleaning solution and remove the black wire. Rinse the rack in running water. Set the rectifier to 4 volts and the electroplating solution to 100 degrees Fahrenheit. Place the gold or stainless steel anode into the plating solution. Put the black wire back on the plating rack. Turn the rectifier on and place the piece to be plated into the plating solution. It only needs to stay there for 30 to 45 seconds, depending on the color desired, so watch it closely. Turn the rectifier off before removing the plated article. Rinse both the plated piece and the plating rack under running water. Use the steam tweezers to hold the piece while drying it with the steamer. The heat from the steamer gets rid of any residual water that would otherwise stain the new plate.